Experts shmexberts don’t you just hate’em. Southwark council can’t stand the idea of segregated cycle lanes through Bermondsey — causing congestion, making the air dirty, killing local shops and making little children’s hair turn green. Well……………cyclists don’t know anything about anything of course. We don’t vote because we all live elsewhere. We enjoy polluted air — we only wear anti-pollution masks to show off and look threatening. And as for killing local shops — well, stands to reason, we cycle because we’re poor, our custom isn’t worth having. We can’t afford to buy cars and so we pick on those better off than ourselves who can drive to their local shops and we try to make their lives harder. Difficult to know where to start really. The temptation to resort to ridicule rather than argument is obvious (you can see I gave in to it above). This sort of stuff is commonly found in the Sun and, no doubt, in London Taxi Drivers Association newsletters. But it’s more than a little exasperating to find it in a council response to TfL. Embarrassing almost if I could stop giggling. 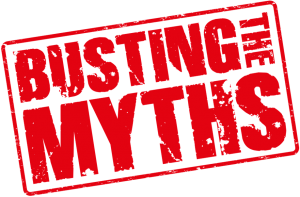 Anyway to help them next time they feel like making fools of themselves we have put together a Mythbusting page.